It's your patio – your retreat after a long workday and a place you want to kick off your shoes and enjoy the weekends. For an area that should be fun and alluring, your patio is about as welcoming as a skunk at a garden party. You've heard people talk about how a patio can “extend your indoor living space.” Draperies and sheers can make one of the grandest statements of all because you're probably not used to seeing them there. Use panels to screen next-door neighbors and create an A-frame “pyramid” over a seating area; use sheers to soften hard lines of pergolas with sheers for instant style. A free-standing fountain (even a small one) can have a transforming visual effect on a patio, adding a resort-like feel to even a cramped space. It will provide a visual focal point everyone will want to watch. At the same time, the sound of bubbling water can have a calming, soothing effect on the senses when it’s the dominant sound on the scene. 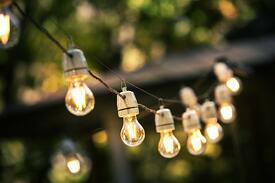 Outdoor lights are a sure way to cast off the blahs. They add instant visual appeal to dark corners and ceilings, overhangs and railings. The design options are plentiful – ranging from tiny, clear globes to large and multi-colored stars, butterflies, dragonflies and lighthouses. Paper lanterns can be a tempting choice – as long as they're hung in a place where they won't get wet. Just as you've personalized your home, it makes sense to personalize your patio space. Look around for a prized possession – a musical instrument, a decorative lamp, a grouping of collectibles, a collection of leather-bound books – and perch it in a prime (and safe) spot on your patio. If you have to build a shelf for your design statement, so much the better; you'll become even more bonded to your patio. After invigorating your patio, you'll want to enjoy it as often as you can. On the days in which the weather isn't cooperating, you'll be glad you have a ZipRite shade from Polar Shades. With the touch of a button, ZipRite shades descend and protect you from the elements while still giving you a full view of your backyard. ZipRite shades can cover a patio as wide as 24 feet and as tall as 14 feet. The fabric, which comes in multiple colors, is as sturdy as it is long-lasting. But then, you probably already knew that because ZipRite shades are made by Polar Shades, America's leading shade manufacturer. Call 702-260-6110 and make an appointment for a free in-home consultation -- and start making the most of your newly energized patio.